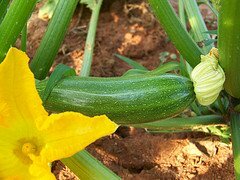 Need Information About Growing Zucchini? You'll find the information you need about successfully growing zucchini right here. Zucchini are easy to plant, easy to care for and easy to harvest. Most zucchini plants are abundant producers and it's not uncommon to get a dozen or more zucchini squash from each plant. They are one of the easiest summer squash varieties to grow and tolerate hot weather very well. Because they are so prolific and easy to grow, zucchini plants are a great way to introduce kids to vegetable gardening. Zucchini is best used fresh, but it can be frozen, dried or pickled as well. Zucchini plants are a type of summer squash that can be grown in both sandy and dense, clay-like soil, and everything in between. They can be grown in both container and traditional vegetable gardens, depending on the variety. Zucchini plants require at least 6-8 hours of daily direct sunlight. Rarer vining varieties require 8 square feet of garden space, while the more common bush varieties only need about 4 square feet. 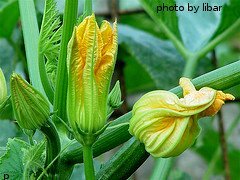 An added bonus of growing your own zucchini are the vibrant, edible, golden orange flowers that precede fruit production. The process of growing zucchini in your garden usually begins with seeds, as transplants generally don't do well if their roots are disturbed. The seeds are typically planted in the spring, after all danger of frost has passed. The squash are usually harvested while they are still immature as the seeds are smaller and the flesh is more tender. Zucchini plants will continue to produce for several weeks as long as they stay healthy and as long as you keep picking them. If your family really loves zucchini, plan on growing 1-2 plants per person in your household. You can also grow an extra zucchini plant and share the squash with your friends and neighbors. Zucchini flowers have become a popular menu item in some upscale Italian restaurants. They are traditionally stuffed and fried. Some people grow an extra zucchini plant or two, just to harvest the blossoms. Click on the following links to learn more about growing your own zucchini.